The period between World Wars I and II was only 23 years. At the end of WW I, the reaction of the public against military activities resulted in large cuts in expenditures for military developments. The initial work of the NACA occurred in this period, which resulted in a substantial background of basic research information for the improvement of airplanes. The airplanes themselves, however, started as fabric-covered, externally braced vehicles with relatively low power. Without the pressure of actual wartime activity, developments by the military services occurred rather slowly. The main incentive for increase in speed occurred as a result of various air race competitions. In England, the development of the Schneider Cup seaplane racers, engaged in international competition, resulted in high-power engines and metal construction that provided the background for the Supermarine Spitfire fighter. In the United States, a small number of sport aviation enthusiasts like the Granville brothers, who, working in a small garage in Springfield, Massachusetts, produced the fastest airplanes in the world. These racers would fly almost twice as fast as the existing pursuit airplanes of the Army Air Corps. With war threatening in Europe, these racing planes provided the incentive for improved fighters and bombers that became available in small numbers at the start of WW II. The outbreak of hostilities in Europe showed immediately the need for increased armament and other equipment that greatly increased the weight to be carried on airplanes. Prior to the war, a newly developed pursuit airplane like the Curtiss P-36 was armed with two 30-caliber machine guns. Fighter airplanes that had been tested in combat soon were equipped with four to six 50-caliber machine guns, armor plate, bulletproof windshields, and self-sealing tanks. The result was an immediate increase in wing loading and a demand for higher power. Similar trends affected the design of bomber airplanes. The primary effect of these changes on the flying qualities of airplanes was greatly increased control forces. The hinge moment (and hence the control force) to deflect a control surface of a given geometric shape to a given deflection varies as the square of the airspeed and as the cube of the linear dimension of the surface. This relation occurs because the load on the surface varies as its area, which increases as the linear dimension squared The hinge moment is caused by the load multiplied by its moment arm from the hinge line, which varies directly with the linear dimension. The result of this relation is that if the speed and linear dimension were both increased by 10 percent, the hinge moment for a given deflection would be increased by 61 percent. If the speed were doubled and the linear dimension increased by 50 percent, a reasonable change between prewar and wartime fighter airplanes, the hinge moment for a given deflection would increase by a factor of 13.5. Fortunately, Gilruth's requirements had shown quantitatively the satisfactory levels of control forces required for different flight conditions and maneuvers. As a result, a great deal of research was conducted at the NACA and elsewhere to provide means for obtaining the desired control forces. One of the most serious problems encountered by designers of military airplanes during WW II was keeping control forces desirably light while airplanes were being made with greatly increased weight, size, and speed. Flying qualities research had shown that maximum control forces should be kept below what a pilot could conveniently exert with one hand on the control stick or wheel. For ailerons, this force was about 30 pounds on a control stick or 80 pounds on a control wheel. Increasing the mechanical advantage of the pilot's controls was impossible because of the limited size of the cockpit and the lag in deflecting a control wheel more than plus or minus 90 degrees. Studies of aerodynamic balancing devices to reduce the aerodynamic moments on control surfaces became one of the main research objectives of wind tunnels involved in stability research. Aerodynamic balance on most airplanes designed prior to WW II was usually accomplished by locating some control surface area ahead of the hinge line. Various arrangements of these balances are shown in figure 6.1. These balances had advantages and disadvantages from both mechanical and aerodynamic standpoints. In general, balances that were permanently located in the air stream were subject to icing that might jam the controls. Balances that broke the contour of the airfoil added drag. In addition to such practical considerations, balances had to be selected on the basis of the hinge moment parameters such as the variations of control surface hinge moment with angle of attack and with control deflection. These parameters had fundamental effects on the flying qualities. 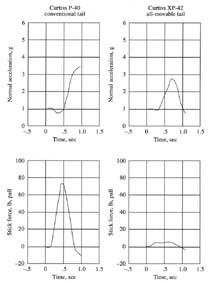 The effect on snaking oscillations of the variation of hinge moment with angle of attack has already been mentioned. To obtain light control forces, both of these parameters had to be reduced. Theoretically, the control forces could be reduced to zero by reducing these hinge moment parameters to zero, but in practice this goal could not be attained. One problem was the nonlinearity of the hinge-moment variations. For example, a control surface that was properly balanced at low deflections might be overbalanced at large deflections. A second problem that limited the degree of aerodynamic balance on large and high-speed airplanes was the effect of small changes in contour due to manufacturing differences. These differences might be almost too small to detect, yet could cause quite large changes in the control forces. The Germans, in an effort to obtain very light aileron forces on the Me109 airplane, would test fly the airplane and try different sets of ailerons until one was found that would give forces in the desired range. The British, on testing the Spitfire, mentioned encountering "rogue" airplanes that had different characteristics from the standard airplanes, the reasons for which could not be detected. As a result of these problems, a practical limit had to be set on the degree of aerodynamic balance, which was usually 25 to 30 percent of the forces produced by an unbalanced control surface. This degree of balance, however, was nowhere near what was required to provide desirable handling qualities on the largest or fastest airplanes. In some cases, forces would have to be reduced to about 2 to 4 percent of those of an unbalanced surface. FIGURE 6.1. 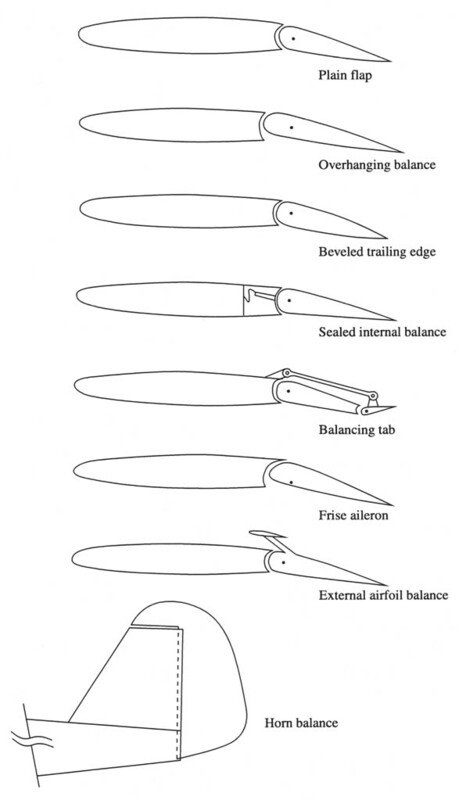 Types of control surface aerodynamic balance. An additional factor complicating the provision of light control forces was the universal use at the start of WW II of fabric-covered control surfaces. All control surfaces had to be mass balanced about the hinge line to avoid flutter. The fabric covering was used to reduce the weight of the surface behind the hinge line so that the mass-balance weight could also be reduced. This weight usually exceeded the weight of the control surface itself because it had to be located quite close to the hinge line. The fabric covering bulged in or out at high values of airspeed, depending on the external pressure distribution and on the way the internal volume of the control surface was vented. Usually, the fabric near the trailing edge was sucked in, which resulted in a large increase in the variation of hinge moment with deflection. To study these problems, it was necessary to know the tension in the fabric, a factor that varied widely with manufacturing techniques and with age. Inasmuch as no instrument for measuring fabric tension was commercially available, I made an instrument that served the purpose quite well. I used a chrome-plated metal bell that was left over from the fire alarm system in the office. A glass tube was attached to the top. The bell could be sealed to the surface of the fabric with grease, and suction applied to the tube to cause the fabric to be sucked up to the shape of a spherical segment inside the bell. A small stylus rested on the fabric, and its displacement was magnified by a lever system inside the bell to move a rod up and down in the glass tube. The formula for the deflection of a spherical diaphragm under pressure then allowed the fabric tension to be calculated. Since wind-tunnel tests had never been made in high-speed tunnels to determine the effect of contours simulating fabric deflection, some analytical work was done to determine the effect of the deflected fabric on hinge moments. Fortunately, this effort was short-lived because manufacturers soon discarded fabric covering and went to metal-covered control surfaces. The problems described previously with aerodynamically balanced control surfaces could be overcome if it were possible to multiply the force exerted on the controls by the pilot. Devices to provide such augmentation of force are called servomechanisms. A number of ways were devised to provide this force augmentation through aerodynamic means. 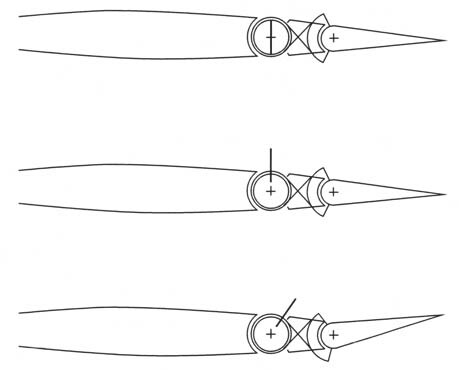 Sketches of some of these aerodynamic servomechanisms are shown in figure 6.2. An arrangement called the Flettner tab had been tried on large airplanes as far back as WW I. This device, which was invented by Anton Flettner, the same man who invented the Flettner rotor for propelling sailing ships, consisted of a small tab mounted at or behind the trailing edge of the main control surface. The pilot's control was connected just to the tab. When the tab was deflected, it moved the main control surface in the opposite direction. Because the hinge moment to deflect a control depends on the product-span times chord squared-it is apparent that very large reduction in the pilot's control effort could be obtained. By the time I came to work at the NACA, this device, shown in figure 6.2(a), was usually called a servo tab, inasmuch as the tab acted as an amplifier to augment the pilot's force. It had the disadvantage that when the pilot moved his control stick while at rest or while taxiing, the control surface appeared floppy and did not respond as expected. To overcome this problem, a spring was placed between the control linkage and the main control surface, so that the surface would move in the desired direction even at zero airspeed. This arrangement, shown in figure 6.2(b), was called a spring tab. FIGURE 6.2. Diagramatic sketches of aerodynamically operated servo controls. (a) Servo tab (top). (b) Spring tab (middle). (c) Geared spring tab (bottom). ....parameters would be affected by this arrangement. Because the control surface was moved by the spring at low airspeed, the variation of hinge moment with the pilot's control deflection was equal to that of an ordinary control surface. At high speed, however, most of the force to deflect the control was supplied by the tab, which resulted in a much reduced force at the pilot's control. The variation of the force reduction with speed could be regulated by the stiffness of the spring. For aileron and rudder controls, this variation of control force with airspeed was not objectionable, but it might cause some difficulties on elevator controls for the following reasons. A conventional manually  operated elevator control, in which the variation of control force with deflection or angle of attack varies as the square of the airspeed, may be shown to give a value of force per g in maneuvers that is approximately independent of airspeed. The spring tab, however, gives a value of force per g that decreases with increasing airspeed. Pilots had become accustomed to a constant value of force per g. Decreased force per g at high speed might lead to a tendency to over stress the airplane. This problem may be overcome by use of the geared spring tab shown in figure 6.2(c). A method of using a tab to reduce control forces shown previously in figure 6.1 was called a geared tab or balancing tab. That is, the tab was moved by a linkage to deflect in proportion to the control deflection. This deflection was usually in the opposite direction so as to reduce the control forces. This device would give a constant value of force per g. However, this device suffered from the same disadvantage as all other types of aerodynamic balance, that if the control had to be closely balanced, the forces would be critically dependent on manufacturing tolerances. I devised the method shown in figure 6.2(c) to combine the geared tab with the spring tab so that at low speed the system behaved as a geared tab, but at high speed the spring tab came into play to amplify the pilot's control force, and therefore, avoid the sensitivity of the control forces to manufacturing tolerances. This device was called a geared spring tab. With proper design, a constant value of force per g could be obtained. I published reports on the spring tab and on the geared spring tab to show how they could be designed to give the desired pilot forces. I also determined the limitations of the devices in controlling very large airplanes and showed that for airplanes as heavy as 300,000 pounds (larger than any produced up to that time), the geared spring tab could be used to provide desirable handling qualities. These analyses are combined in an NACA Technical Report (ref. 6.1). A little thought will allow an appreciation of the remarkable capabilities of spring-tab controls, which allow a human pilot, applying comfortable forces to the control stick or wheel, to maneuver a vehicle weighing as much as 300,000 pounds flying at an airspeed of 300 miles per hour or more. The spring-tab analyses were discussed with various manufacturers, and spring tabs were widely used on large airplanes. Perhaps the most notable example of their use was on all the controls of the Douglas DC-6, which has had a remarkable record for reliability and excellent handling qualities. Gilruth made the remark that the DC-6 was "the last of the airplanes," meaning it was the last very large airplane in which the pilot, moving the controls directly with his own muscle power, could easily perform all the desired maneuvers. This remark is not completely accurate because other large airplanes of the same period, such as the Boeing B-29, used spring-tab controls. Nevertheless, it illustrates the desire of designers and pilots to have the feeling that they were directly connected to the controls with a reliable mechanical linkage and not dependent on more complex mechanisms such as hydraulic or electric systems. Spring tabs had many desirable features, but they had two disadvantages. One was a tendency to flutter, which required careful analysis to avoid this dangerous condition. Another was that the tab, deflected in the opposite direction from the control surface, reduced the maximum moment produced by the control. In the case of ailerons, for example, this effect would require ailerons of increased span, which would leave less room on the wing for high-lift flaps. To overcome these disadvantages, a device called a whirleron was proposed by Gilruth. This device consisted of a small windmill mounted on a shaft projecting from the trailing edge of the wing. The windmill was connected to the aileron through gears and shafting so that about two revolutions of the windmill corresponded to full aileron deflection. Normally,  the windmill blades were aligned with the wind, but they were connected to the pilot's control stick so that the pilot could control the setting of the blades. The blade angle actually was proportional to the difference between the pilot's input and the aileron deflection so that when the aileron reached the desired deflection, the blade angle would be returned to neutral. After analyzing this device, a wind-tunnel model was tested. The results appeared favorable when the engineers tested it. However, when the Chief of Research, Floyd Thompson, was invited to see it, he slammed the control stick hard over and the windmill hit the stop so hard that its blades and shafting were knocked loose. Another problem revealed by the tests was that the gyroscopic moments on the blades, which tend to move them into the plane of rotation, caused unstable stick forces. As a result, a second model was built, with blades swept back and counterbalanced to avoid the unstable stick forces, and suitable shock absorbers put in to avoid loads due to hitting the stops. This device worked well, but as will be discussed subsequently, the need for such devices was rapidly decreasing with further airplane developments. Also, no thought had been given to protection against icing. In running the whirleron tests, I learned something about the motivation of inventors. In connection with the project, I made a library search to see whether any similar work had been done in the past. I found that the British had tested a similar device on a Handley-Page Bomber in the early 1920's. When I showed this report to Gilruth, he commented that they had some really smart engineers back in those days. After that, however, Gilruth never showed the slightest interest in further studies of the whirleron. Perhaps the idea of being the originator of a device is an important factor in determining the inventor's enthusiasm for it. The first really serious compressibility effects on airplanes were encountered in high-speed dives of fighter airplanes in WW II. When pilots put these airplanes in terminal velocity dives starting from about 30,000 feet altitude, they were frequently unable to recover. In cases where the airplane did recover, it often came back with the wings bent or wrinkled due to excessive accelerations in the pull out. The cause of these problems was the formation of shock waves on the upper surface of the relatively thick wings, which caused flow separation. The separated flow, in turn, resulted in loss of downwash at the tail that caused a large diving moment and a large rearward movement of the center of lift on the airplane, which required greatly increased elevator deflection to recover from the dive. The result was that the control force to recover from the dive was greatly increased, sometimes beyond the strength of the pilot. As the air temperature increased with decreasing altitude, the Mach number decreased, which sometimes resulted in rapid recovery of elevator effectiveness, resulting in an excessively violent pull out. FIGURE 6.3. All-movable horizontal tail installed on Curtiss XP-42 airplane. .....force per g would have the advantage of being independent of fore-and-aft location of the center of gravity of the airplane. With conventional elevators, the force per g ordinarily increased with more forward center-of-gravity location, and vice versa, thereby limiting the center-of-gravity range in which satisfactory control forces could be obtained. An all-movable tail surface of this design was installed on a Curtiss XP-42 airplane (a modification of the P-36) (figure 6.3). After making a high-speed taxi run, the pilot, Mel Gough, came back extremely perturbed and said that the airplane was completely uncontrollable. At first, no one could determine the reason for this unexpected behavior. As a result, I built a tail for a model glider that simulated the design features of the XP-42 tail. When the model was flown, it performed a continuous short-period longitudinal oscillation with the tail banging back and forth between its stops. It was immediately apparent that the aerodynamic center of the tail was actually ahead of the hinge point, which caused the tail to overbalance. Some rather subtle aerodynamic effects were then found to explain this condition, including the floating tendency of the tab, the effect of aspect ratio of the tail, and the effect of the trailing edge angle of the airfoil used. This problem was cured by attaching projecting strips along the trailing edges of the tail. This device had been used on previous airplanes to increase the hinge moment due to deflection. After this change, the airplane was flyable, but the pilots still considered the control extremely sensitive and unsatisfactory for any kind of practical use. The cause of the difficulty was analyzed by comparing the stick force variation in a rapid pull up on the XP-42 with that on a similar airplane, the Curtiss P-40, with a conventional elevator. Both airplanes required the same stick force in a steady turn, but in the abrupt short-duration pull up, the stick force on the XP-42 was very small, whereas on the P-40, it was larger than that required for a steady turn at the same value of normal acceleration (figure 6.4). These data are somewhat incomplete because of the short length of the records, but they show quite clearly the large difference in control forces to produce approximately the same value of acceleration in a rapid pull up. The rapid buildup of stick force with the conventional elevator gave the pilot a warning of what value of acceleration to expect if the maneuver were continued, whereas this warning was not present with the XP-42. FIGURE 6.4. Comparison of stick forces in rapid pull ups with Curtiss P40 airplane and Curtiss XP-42 airplane. Both airplanes had the same force per g in a steady turn or pull up. ....control forces were similar to those on a conventional airplane, and the handling qualities with the all-movable tail were satisfactory. Evidently what was needed to obtain the desired advantages of the servo tab controlled tail without the problem of inadequate forces in rapid pull ups was a mechanism that would transfer the tab from a geared unbalancing tab in the first stages of a maneuver to a servo tab as the maneuver continued. This behavior could be obtained by use of a viscous damper in the linkage to allow the tail hinge moment to move the damping piston at a controlled rate, which in turn moved the tab to a position that would result in zero tail hinge moment. This system  was tried in the XP-42 with satisfactory results. 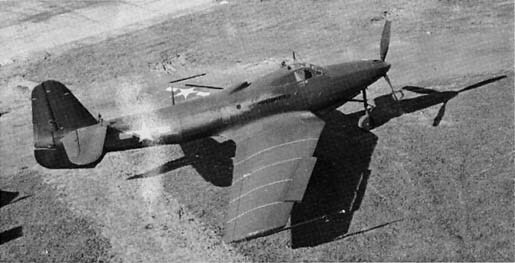 After the tests of the XP-42 were started, studies were also made with closely balanced conventional elevators on a Bell P-63 airplane. Again, the control forces were supplied by a bob-weight, and the same problem of lack of warning of the acceleration in a maneuver was encountered. A similar viscous damper installation (also called a dashpot) was installed in series with a spring connected to the pilot's control stick. This system also reduced the undesired variation of control forces with center-of-gravity position and provided satisfactory handling characteristics in maneuvers. The WW II fighters encountered compressibility effects in high-speed dives, but they were still incapable of supersonic speeds even in dives. With the rapid development of fighter airplane design after the war, however, fighters were developed that reached supersonic speeds, first in dives and later in level flight. At supersonic speeds, the effectiveness of a tab on a tail surface is very small, and the hinge moments of the surface itself undergo erratic variations in passing through the transonic region. As a result, the use of a servo tab to operate the tail as envisioned by Gilruth was not satisfactory. For these airplanes, hydraulic powered controls were developed that provided far more force to actuate the control surfaces than the human pilot could supply. As a result, all the previous emphasis on very closely balanced controls disappeared. The designer was still faced with the problem of providing satisfactory control forces for the pilot, however. In most cases, the force input to the hydraulic actuator was close to zero, and all the pilot's control force was supplied by a feel device. The design of these feel devices proved to be a difficult problem. In general, most designers first envisioned a bob-weight just as had been tried on the XP-42. Fortunately, the NACA research on this airplane and on the P-63 showed how to design a satisfactory feel device for longitudinal control. I have always felt that the NACA research on these airplanes was one of the most important contributions to knowledge of handling qualities. As a result, I collected the reports that had been written on these projects in a separate folder and always kept them available for discussions or consultation with designers of new airplanes. In the previous discussions of control surface hinge moments, the various approaches to reducing the control forces to desirable values have been considered. The earliest technique was use of aerodynamic balance. When airplane speeds and sizes became too large for this approach to work, various types of tab controls such as spring tabs and geared spring tabs were used. When supersonic speeds were reached, tab controls became ineffective and hydraulic power controls were adopted. In the 1940's during the early stages of this progression, I conceived a fundamentally different idea. I reasoned that if the position of the control surface hinge line could be moved to the point that the lift on the surface multiplied by the distance to the hinge line just balanced the aerodynamic moment on the surface, the surface would be in balance and the pilot's control force would be zero. This idea may be likened to moving the balance point on a see-saw so that it is in balance even though the weights on the two ends are different. My first analyses considered that a motor or servomechanism would be used to move the hinge. Later, I did some work on the idea that the lift or control force could move the hinge line directly through some aeromechanical mechanism. The logic for moving the hinge basically depends on the idea that if the lift on the  surface is up, then a nose-up moment on the surface should be balanced by moving the hinge line forward, and a nose-down moment should be balanced by moving the hinge line back. If the lift on the surface is down, these motions should be reversed. A practical problem appears in that as the lift goes through zero, the hinge must be moved from infinity in one direction to infinity in the other direction. In many cases, the lift on a surface does reverse or oscillate in the course of a maneuver. As a result, the mechanism for moving the hinge would have to be very fast. I first concluded that this solution would be impractical, but as devices for moving controls became more and more complex, I kept coming back to this idea to try different approaches. My last attempt at analysis was made about 1952. I never did reach a solution that appeared at all promising. One problem that soon appears in attempts at analysis is that the problem is nonlinear if a reversal of lift is taken into account. I did not have the necessary means to analyze such a problem. An analog computer would have made it possible to simulate different types of mechanisms, but such computers were not available at Langley at the time. Later, when analog computers did become available, it always appeared to me that many of the nonlinear problems that engineers worried about in earlier years were no longer of interest to them and were never studied with analog computers. The excellent analog computer complex at Langley Research Center was discontinued in 1990 because of lack of use. Now, such problems can be studied by digital computers with programs that allow setup of the problem with block diagrams similar to those used for analog computers. The speed of digital computers may not allow real-time solutions of problems involving very high frequencies, such as might have been encountered with the balancing mechanism, though such problems could be studied using an extended time scale. The servo-tab and spring-tab controls described previously operate well at subsonic speeds, but become ineffective at supersonic speeds because the ratio of control surface hinge moment to lift produced increases greatly under these conditions. The reason for this change is primarily that the pressures on the upper and lower surfaces of the wing caused by control deflection do not carry forward of the hinge line at supersonic speeds. If a tab were used in an effort to defect the control, the tab would have to be so large that the lift produced by the tab would just about offset the lift due to the control surface. To overcome this problem, I conceived a device in which a spoiler ahead of the control surface hinge line produced a moment to deflect the control. This device has also been referred to as a rotary servo tab or a vane-type servo control. A sketch showing the operation of the device is shown in figure 6.5. A vane or spoiler operated by the pilot is mounted in a tube ahead of the control surface hinge line. When the vane is deflected, its drag causes the tube to rotate. The rotation of the tube is linked to that of the control surface, so that when the vane moves up the control surface also moves up. This device should remain effective at supersonic speeds because the spoiler itself is known to produce a lift force in the correct direction, the reduced pressure behind the spoiler should aid in deflecting the control surface, and the control surface itself would produce lift in the same direction. By use of a feedback linkage from the control surface to the tab input link, the system could readily be arranged to operate in the same way as a servo tab or spring tab. FIGURE 6.5. Diagram of operation of vane-type servo control. (a) Control in neutral (top). (b) Vane deflected (middle). (c) Vane and control surface deflected (bottom). ....was obtained on the device, but it was never used on an airplane. These tests were published at a time when the use of hydraulic controls was becoming common, so that the need for such a system no longer existed. This device, however, is probably the only type of manual control ever tested that would retain enough effectiveness at supersonic speeds to control an airplane. The wind-tunnel tests showed that there was considerable buffeting of the control when it was deflected at high speed, which might be a serious problem on a full-scale airplane. One of the most important developments in the design of high-speed airplanes during the wartime years was the realization that a swept wing would have much less drag in the transonic and supersonic speed range than an unswept wing. The story of this discovery at Langley is told in Engineer in Charge (ref. 1.1). Though there were initial doubts about the validity of this concept, by the end of the war experimental studies by the free fall method and other techniques had shown that the concept was indeed correct. In addition, the development of the jet engine had made flight in the transonic range feasible. Prior to these developments, swept wings were in poor repute for use on subsonic airplanes. It was generally known that the stalling characteristics of swept wings would be adversely affected by the flow of boundary layer to the tips as the stall was approached, which causes a so-called tip stall that results in rapid roll at the stall with no warning in the form of buffeting. In addition, swept wings were poor from the structural standpoint and had lower maximum lift coefficients than unswept wings. As a result, very little experimental data were available on the aerodynamic characteristics of swept wings. The result of this situation was that in practically every wind tunnel, the work in progress was stopped and a program of research on swept wings was initiated. FIGURE 6.6. 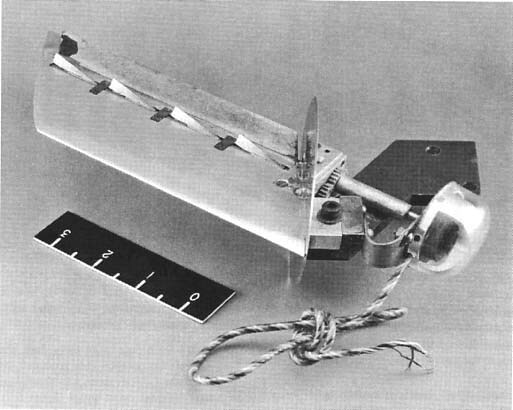 Photograph of test model of vane-type servo control. Semaphore-type vanes deflected 12 degrees. To get some idea of problems that might be encountered with swept wings, I made simplified calculations to determine the magnitude of some effects that might result from this configuration. The dihedral effect, or rolling moment due to sideslip, of a swept wing was known to increase with lift coefficient. In addition to this problem, however, was the effect of the airfoil section pitching moment on the stability derivatives. On an unswept wing, the section pitching moment affects only the longitudinal characteristics, but on a swept wing the pitching moments about axes swept with the wing panels have components that affect the rolling moments. My analysis showed that a swept wing with cambered airfoils would have a reduced dihedral effect. Twist of the tips in the direction to reduce the lift on the tips would also reduce the dihedral effect. These effects were not then known to most researchers. I presented these results at meetings of the Langley Stability and Control committee. FIGURE 6.7. Bell L-39 airplane incorporating experimental swept wing to study low-speed effects of wing sweep. 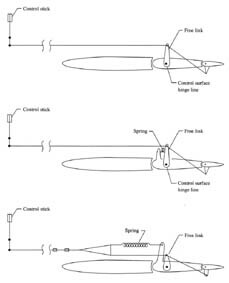 ....near the wing root with a straight trailing edge and by the concentration of stiffness in a spar through the wing root as near as possible to the trailing edge. Experimental studies of the effects of sweep were also made in the Flight Research Division by methods devised by Robert R. Gilruth. These methods, to be discussed later, were the wing-flow method and the free-fall method. The ready availability of these methods provided much-needed data to the aeronautical industry before the development of the slotted-throat wind tunnel made transonic wind-tunnel testing possible. To get full-scale data at an early date, the Bell Aircraft Corporation also produced for the NACA the L-39 airplane, a P-39 airplane with experimental swept wings (figure 6.7). This airplane was not capable of transonic speeds, but studies were made of the stability and control characteristics and of expected low-speed problems such as poor stalling characteristics. The use of wing slats and other stall-control devices was studied in flight.